Why Chelsea Manning is so beloved by many LGBTQ people. 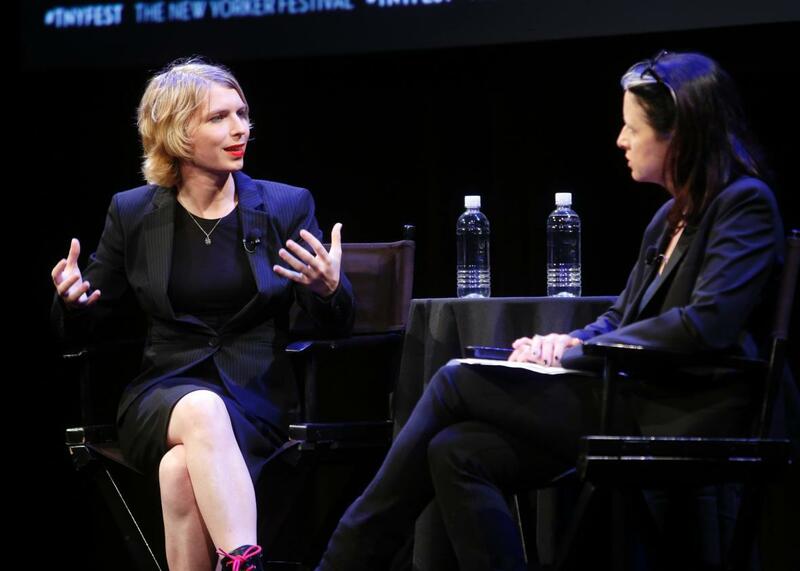 Chelsea Manning talks with the New Yorker’s Larissa MacFarquhar on September 8, 2017 in New York City. From the adulation that greeted her at the Pride parade this year in NYC, to her splashy profile in Vogue, to her more than 300,000 followers on Twitter, Chelsea Manning has been embraced by the queer community with a vengeance. For many of my straight, cisgender friends this popularity is inexplicable, irritating, maybe even alienating. Why Manning, they wonder. When there are trans women who have served with distinction in the military, when there are trans activists who have lived exemplary lives, why has such a controversial figure been the recipient of so much love? This bemusement has even made its way to the New York Times op-ed page, where James Kirchick concern-trolled Manning’s fitness to serve as a symbol of trans acceptance in the military and mocked her Twitter presence as “the doodles of a freshman peace studies major.” Kirchick’s essay suggested that blind fealty to identity politics was the sole reason for the embrace of Manning by the LGBTQ community. As someone who counts myself among Manning’s fans, this reading struck me as shallow and deeply unfair. I could never convince Manning’s haters to feel about her the way I do, but I can try to explain why her story has resonated so deeply with a community where suicidality, public humiliation, rejection by family and friends, and even incarceration is closer to the norm than the exception, and the ability to rise above it all too often feels out of reach. Chelsea Manning is not loved in spite of her past, but because she hasn’t allowed herself to be hemmed in or ground down by it. Manning’s seven years behind bars doesn’t read to transgender people the way it does to mainstream America. Compared to other Americans, LGBTQ people are more likely to be incarcerated, and transgender women have among the highest rates of all. 21 percent of trans women experience incarceration, compared to 5 percent of Americans overall. There’s a complex set of reasons why this is true, including bias on the part of police against trans women, difficulty finding legal employment when you’re trans, family rejection which leaves too many young trans people on the streets, and high rates of depression and anxiety which further depress employment and destabilize trans people’s lives. 1 in 5 trans people have experienced homelessness at some point in their lives, more than 1 in 4 report having lost jobs due to bias, and 40 percent of trans people report having made a suicide attempt. What these numbers can’t tell you is how it feels to be ashamed of who you are. A trans friend I know from Knoxville has barely left her home since coming out. Another dropped out of school when the pressure of being visibly out became too much. For myself, I’ve written about some of the most intimate details of my life for Slate, but I’ve never written about having been homeless for a year, because I worry about what people will think of the person I used to be. Although the LGBTQ community has made great strides towards acceptance, bias continues to obstruct our ability to work, find housing, and live lives free from violence. This is felt by queers of all stripes, but it’s no secret that trans people—trans women—fare the worst of all. There may come a day when respectability politics tames trans activism, but too many of us are too marginalized for that day to be here yet. Chelsea Manning’s personal struggles, darkest moments, and most questionable decisions became the subject of national headlines for seven years. When news started to surface that she might be trans, queer people worldwide cringed at the crude mockery she was subjected to, as the crime of being trans inevitably eclipsed her actual crimes. While Manning was in prison we feared for her safety amid reports of punitive treatment and suicide attempts. When she emerged from prison unbowed, returning the hatred she’s served with daily with volley after volley of cheerful emoji and exhortations to create positive change it felt like a small miracle. Our spirits soar because we know it could be otherwise. Too many queer lives have been broken by less. Of course, it helps that the crimes Manning committed had the effect of better informing the public about the U.S. government’s conduct in diplomacy and war. Often dismissed as irrelevant because of the relative indifference to these stories shown by most Americans, these revelations demonstrate for those of us who cared to see the sorts of things the U.S. government is willing to do in our name. To be clear, this doesn’t make any criticism of Manning illegitimate. Many commentators have taken issue with the indiscriminate nature of her leaks, which were never vetted for the sorts of details that could have put others in harm’s way. For many members of the military, the recklessness of her release of classified documents make it difficult or impossible for them to forgive her. It’s not my intention to defend every decision Manning made, or to argue that others have no reason to feel angry or betrayed by her actions. However, as someone who has felt haunted by my own past mistakes—mistakes that had no positive impact for anyone, even myself—it’s hard to feel that seven years in prison wasn’t enough. Manning served more time than any whistleblower in U.S. history, some of it in absolutely appalling conditions. She has apologized to anyone she may have hurt. She’s earned the right to reenter public life. And, what a re-entry it has been! Manning’s Twitter feed is like none other, interspersing calls to fight authoritarianism, prejudice, and the military industrial complex with cheerful strings of pictograms. As a voice for social change she is clear and unapologetic, and her words carry the weight of someone who has paid a heavy price for doing what they believed was right. When she makes forays into fashion and popular culture, as in the Vogue shoot, she reminds us that a sense of moral duty isn’t incompatible with taking joy in life. She exults in being able to breathe free, in a way only someone who was recently imprisoned can. Manning’s feed buoys my belief in my own ability to make change and gives me a reason to have hope. If someone else was writing Manning’s tweets there’s no way I’d feel about them as I do. It’s because I know how low she’s been, and the viciousness of the hatred she faces every day, that her positive attitude has the power to break through my own fears and doubts. Her resilience in the face of haters from without and self-doubt from within is a perfect example of what the LGBTQQ community means by “pride.” Her pride makes me feel proud too, not in spite of what she’s done and where she’s been, but because she’s been there and serves as a daily reminder that it’s possible to come out the other side smiling.